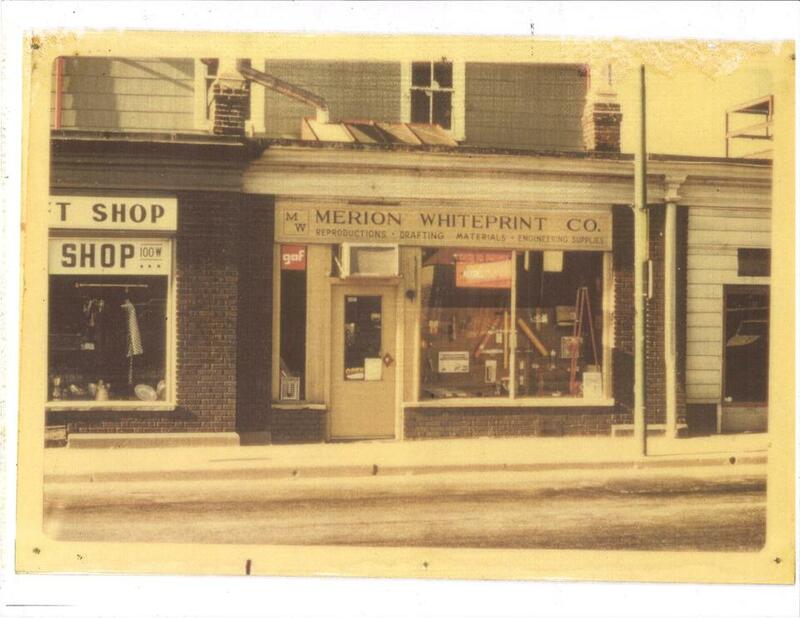 Merion Art and Repro began in 1971, as “Merion Whiteprint.” Army buddies, Ed Gamburg and Louis Simone, rented a whiteprint machine, a car, and a store, for less than $500 total per month. They opened a tiny storefront and began printing whiteprints (similar to blueprints) for local architects. They delivered them with a rented Ford Pinto. The business grew quickly, as they were providing a service that there was a real need for. Before that, local architects could only get prints made and delivered twice a week. They soon expanded the business to include drafting and drawing materials, because architects who were already at the store for prints needed somewhere to get their other supplies as well. As business began to flourish, Lou and Ed decided to expand. They bought out the inventory of a local art supply store when it closed in 1973, and rented the storefront next to theirs to accommodate the newly purchased art supplies. It was at this time that they began hiring artists and art students as store staff. Since Ed and Lou were new to the art business, they used the art world knowledge of their sales staff to help grow this new part of the business, which would soon become the main element of the company. Carrying art materials was a great boost to Merion Whiteprint, and art supply sales soon caught up with the original Reprographic side of the business. The company evolved to become Merion Art and Repro Center. Within a few years it was time to expand again, this time by renting another adjacent storefront. By 1976 Merion Whiteprint Inc. occupied 100, 102 and 104 West Lancaster Ave, extending all the way to the corner, and the store became “Merion Art and Repro Center”. Business was booming and by 1980 the store needed to expand once again, finally making the move down the road into the location we all know and love, at 17 West Lancaster Ave, in Ardmore. In the late 1980’s, computers forced the store to morph again. Computers quickly and drastically changed the way architects, artists, and designers worked. The demand for certain materials changed as people made the switch to computer assisted design, and their printing needs changed, as well. The old whiteprint machines were scrapped in favor of new computerized large scale printers, laminators, and dry mount machines. The early 90's brought a major store renovation and cosmetic changes to the outside of the store. In 1992, Merion Art added a custom framing department, a natural addition to the art supply departments. Merion Art now had the capability to sell the materials to make art, reproduce art via the reprographics department, and display and preserve art with professional custom framing as well. In the early 2000’s, the next challenge to Merion Art came from the internet. Large corporations and big-box stores threatened to undercut prices of small local businesses. Merion Art joined iAMart, a collective buying group of independent art stores across North America that allows members to get exclusive deals from suppliers and pass their savings on to customers. Merion Art also renewed its focus on the things the internet didn’t provide: a personal touch, a physical presence, a human connection, and a knowledgeable staff. Around this time, Merion Art instituted a 20 question quiz about art materials that all sales-floor associates were required to pass, which is still used when hiring new staff today. This test is full of questions that are difficult for the layperson but are common knowledge for artists, assuring that all sales associates have a working knowledge of the things they sell and recommend. Sadly, in December 2013, Lou Simeone, one of the original founders of Merion Art, passed away. Over his 42 years at Merion Art, he was a familiar face on the sales floor. He spent much of his time dealing with people in the store, and was much loved by both staff and customers. Lou was a driving force in the growth and success of Merion Art, and he is still greatly missed. Shortly after Lou's passing, Merion Art became more of a family business, as Ed’s son-in-law Joe Lyons came on board as our new Chief Financial Officer. Along with changes in personnel came changes in technology- in 2014 we finally transitioned to a new point of sale computer system, replacing the old system which had been used since the 1980's. While our: "If it ain't broke, don't fix it" mentality worked quite well, something better came along and now our new system allows us to better integrate with the web, order products more efficiently, keep track of stock more effectively, and it generally makes everything a little more logical and organized. In 2015 we were honored to be featured in the national publication of Art Materials Retailer Magazine, the leading informational magazine for retailers of art and architecture supplies. You can read our spotlight article here. 45 Years and Still Going Strong! In the last 45 years, Merion Art and Repro has changed constantly. The store now carries a huge selection of fine art products that dwarfs the small shelf of drafting supplies Ed and Lou began with, all those years ago. The entire staff has an impressive breadth and depth of art experience, including professional fine artists, graphic designers, tattoo artists, set designers, graduates of prestigious art colleges, and professional framers. The Repro department now includes digital photo printing, large scale plotting, and graphic design. The framing department has expanded to frame museum quality artwork in addition to large corporate orders for non-profit organizations. We have added online ordering and social media outreach to our repertoire. Our core values, however, have remained the same. The focus today is the same as it was in 1971: on providing exceptional service, quality materials, vital information, and a variety of new products, all to help architects, artists, designers, and crafters to further their creative process.